Another ill-conceived attempt to be the author of a regular newsletter is taking hold of me. My summary of Sept 17, 2017 service on talking to friends and neighbors about things you really, really disagree about was wholly underwhelming. I found a much better description about how to talk to people that act in ways that you cannot fathom. It was published on Patheos and you can find it here. Daryl Davis is an African-American man who is fascinated by American hate groups like the Ku Klux Klan. In researching the Klan in America, he sought out members and met with them. And befriended them. And was the cause of some of them leaving the Klan. He can prove it with the Klan robes they gave him after they left. He has advice for talking with people with a very different viewpoint (which I’m hoping will inform our approach to Christians), but I can’t resist first giving one anecdote. 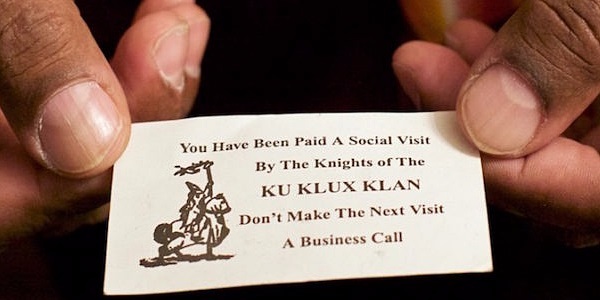 There are different approaches to dealing with hate groups, and engaging with and befriending (as in making a Klansman an invite-him-to-your-wedding kind of friend) is pretty radical. First, give the other person the safe space to express themselves. Ask honest questions, but don’t attack. You’re having a conversation. Respect their right to speak, even if you don’t respect what they’re saying. By engaging, by simply being there, they open themselves up to new ideas that might grow in their minds. He gives dogs as a parallel. If you beat a mean dog, it becomes meaner. The same is true for a hateful or closed-minded person. Push back directly, and the backfire effect comes into play. You’re attacking who they are, so they dig in their heels and cling to their beliefs even more. Instead of hate, you should rely on logic, respect, and patience. Learn your opponent’s position. Know it as well as they do, so well that they would accept your statement of their argument. If you begin not knowing their position well, compensate with humility and listening. What you hear may be hateful or illogical, but don’t overreact. When in doubt, listen rather than fight back. Remember that you’re playing the long game. A debate needn’t be angry, but it’s zero-sum. It’s a fight, and you can’t have two winners. Instead of a debate, you want a conversation. A conversation is an invitation for someone to share their position, and most people are happy to oblige. Create a welcoming environment. Use small talk and look for overlap in your lives. Do you both have dogs? Are you in similar professions? Do you have similar attitudes about health care, education, or foreign policy? You’re finding common ground. This is a marathon, not a sprint, so don’t think that chitchat is a waste of time—you’re working on a relationship, maybe a friendship. If Christianity comes up in conversation, that’s great. But if kids or pets or career comes up, that’s great, too. It takes time to learn Christian arguments (or the particular variants that this antagonist uses), especially when tangents can be wide ranging—the religions of Mesopotamia, Greece, or Egypt; the role of fiction during the time of Jesus; the history of Israel, including the forced exiles and invasions of Palestine; the religious movements in the Ancient Near East during the intertestamental period, such as Gnosticism, Apocalypticism, and Marcionism; and so on. Knowing the material earns respect, but don’t get overwhelmed. Listen and learn. Let your antagonists teach you—you’ll get smarter, and they’ll appreciate your humility. Put yourself in the way of a discussion. Attend an Alpha Course. Find an interesting Sunday school class at a local church. Find a local Reasonable Faith or Reasons to Believe chapter. You’ll learn far more by hanging out with Christians than with fellow atheists. And, while you’re learning about them, they can’t help but learn about you. Put some effort into your first impression. A Christian acquaintance won’t say, “We’ve got an interesting class at my church—you should come” if you’re a jerk. Make your point, correct errors in logic or facts, or get annoyed at rhetorical gamesmanship, but don’t be insulting or condescending. State your correction, but don’t delight in their failure or make them feel stupid. Give them their turn, and don’t cut them off when they make a point. Once they’ve made a point, look for authentic clarifying questions to ask. They will appreciate your interest, and your questions may force them to confront problems that they hadn’t been aware of when it was just an idea in their head. Don’t put words into their mouth, and let them explain their point. Pay careful attention so that you’re responding to the strongest interpretation of their point, not a caricature or strawman version. If this approach is useful for atheists talking to Christians, is the reverse also true? Perhaps. The shrewd Christian might try to make this an emotional discussion—wouldn’t you want for there to be a benevolent god looking out for you? Doesn’t it only seem fair for there to be an afterlife where the Hitlers of the world got justice? And so on. Still, Christians engaging in a long-term relationship with the goal of discussing Christianity’s truth claims put themselves in the way of atheist ideas. And that has to be a good thing.